This article was first published in the Marketer – Journal of the Society for Marketing Professional Services (SMPS). Also read a companion article Marketer’s Digital Toolbox 2.0. Marketing is packed with buzzwords. While mostly innocuous (if a little annoying), the buzzword-y nature of today’s marketing does have one major downside: It makes it too easy to dismiss ideas that deserve attention. Such is the case with omnichannel marketing – a concept that brings together all the central elements of digital marketing, including data, content, experience, and personalization. In other words, omnichannel marketing is one buzzword marketers should not ignore. Multichannel marketing simply means that the marketing message is distributed across multiple communication channels. Omnichannel takes all of the individual channels and brand touch points and creates a single, unified, and seamless experience across the entire customer journey. So the focus is on optimizing the experience across all phases of customer engagement and across all channels, screens, and devices. It’s more than simply being in front of your customers wherever they happen to be. It’s meeting each customer in the right place, with the right message, at the right time—thus shortening the sales cycle and building much stronger, lasting customer relationships. Multichannel’s value proposition is increased awareness and, possibly, reach – as a result of being seen in more places, more often. Omnichannel’s value proposition is increasingly better decision-making at each point of contact, resulting in better engagement and action. Although omnichannel marketing earned its reputation for generating results in B2C, the very nature of the B2B dynamic makes these firms better positioned to capitalize on the advantages of omnichannel. Revenue Depends on Relationships. B2B firms live and die by the strength of their relationships. 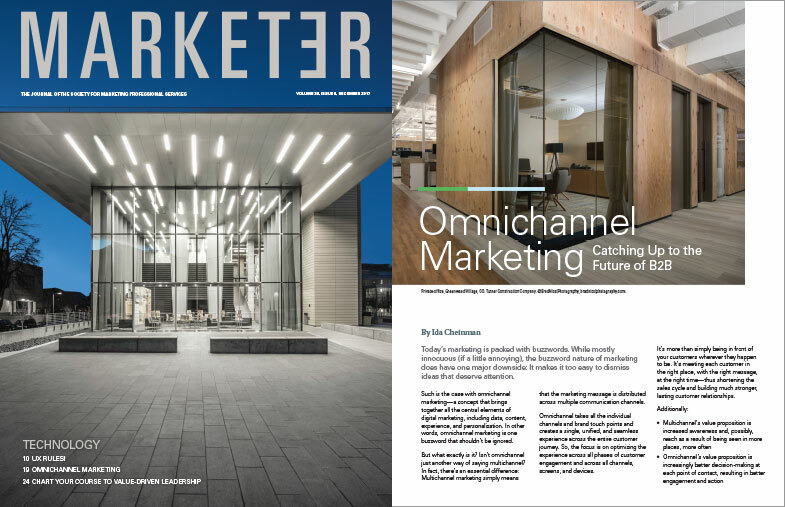 Omnichannel marketing emphasizes building deeper relationships through the practice of better understanding customers, becoming more relevant to them, and being truly present with them. Facts Beat Assumptions. The pressure on marketing to be more strategic and accountable and to demonstrate ROI is mounting. In omnichannel marketing, decisions are based on hard data, not guesswork. Room for Risk Is Nil. With shrinking marketing budgets, B2B firms have even less room for error. Omnichannel’s central promise is well-informed decision-making, the first step on the path to reducing risk. Omnichannel implementation has two essential requirements: understanding the firm’s customers – who they are and what they need, want, and expect—and making sure that every touch point is seamless and on brand. This increased level of understanding and clarity is how omnichannel marketing delivers on its central promise to help firms make smarter marketing decisions. To achieve that, however, marketers need accurate data and the power of technology. Both data and technology enable marketing teams to gain knowledge and insight, which translate into improved targeting and, subsequently, improved reach. The ongoing deeper learning is also essential to continually improve the relevancy, consistency, and authenticity of communications and, therefore, the overall effectiveness of marketing programs and campaigns. Quite simply, omnichannel marketers are always striving to gain a better understanding of what works and identify paths to improvement. Therefore, they’re much better equipped to increase conversions at each point in the customer journey and, by extension, improve the firm’s overall lead-to-revenue conversion ratio. The primary obstacles to implementing omnichannel are the same roadblocks that prevent firms from leveraging any effective strategy. Today’s integrated marketing approach relies on the ability to collect, analyze, and share real-time information across departments, offices, and often continents. And doing so requires a corporate structure, culture, and technology toolkit capable of supporting and facilitating this level of collaboration and transparency. To execute omnichannel marketing, you need an integrated, agile, and crossdisciplinary team of people who can bring new thinking and perform well across all skill sets and technologies—whatever they may be today or tomorrow. You can’t provide a unified customer experience if your internal structure doesn’t support sharing data and insights. Break down the silos and create a culture and processes that ensure internal collaboration and the free flow of information. B2B marketers need to get better at capturing information from every customer interaction and learn to understand and apply gained insights at each critical juncture of the customer journey. Two applications where customer intel – including real-time data, customer research, and direct feedback – is invaluable are buyer personas and customer journeys. Develop Meaningful Buyer Personas: The customer is at the center of omnichannel marketing. Understanding your primary decision-makers, beyond a few superficial demographics, is essential. Use buyer persona templates to capture key facts about each customer type and to develop detailed profiles. Map Customer Journeys: Develop customer journey maps that depict your customers’ needs, challenges, attitudes, interactions, and actions for each stage in their engagement with your firm. Reviewing data and analytics at each touch point will help you tailor communications (online and off) and to move customers along their decision-making path. Different customers want to interact with companies in different ways – and always on their own terms. Some prefer to talk with “real” people; some like finding information, and even taking initial steps, online before contacting your firm. Customer data and analytics will reveal a lot about your audiences’ individual preferences, but sometimes it’s best to simply ask customers how they prefer to communicate. Delivering contextually relevant messages and content is a priority of omnichannel marketing. The context of each interaction informs the next, and each builds on a conversation already in progress. Understanding customers’ context is what enables marketers to deliver a personalized experience and communications that are tailored to the needs of individual customers at a specific stage in their relationship with your firm. This not only creates relevance and increases engagement and action; it also saves you from embarrassing mistakes, such as sending communications suitable for the “barely aware” segment to your firm’s lifelong customers. We all hate getting messages that reveal that the sender has no idea who we are or understand our current relationship. Omnichannel’s proposition is fueled by insight from dependable data – both gained and applied in real time. To do this, you need the right technical expertise and tools that evolve with your goals and the needs of your customers. Omnichannel requires tools for mining, analyzing, and sharing data. To say that any firm can implement an omnichannel marketing strategy regardless of its existing infrastructure and technology is far from the truth. However, it doesn’t require completely new or expensive technology. What’s needed is well within the reach of any size firm – and likely much of it is already in your digital toolbox. See “Marketer’s Digital Toolbox” for the technology you’ll need to get started with an omnichannel marketing strategy.